Missed CFUN-2k last weekend? What happened?!? CF *stars* spilled their guts, sharing CF art with mortals. Get the code! It's free. Visit http://www.cfconf.org/cfun2k/cfspeakers.cfm. CFUN-2k was sold out -- even though the event was free! Over 600 CF developers braved bad weather to fill the Masur auditorium at NIH, sending some to an overflow room linked by video. A packed crowd enjoying some CFUN, TeraTech style. TeraTech http://www.teratech.com/ organized the event, did registration (a dream), made the t-shirts, CD-ROM etc. The CFUN-2K CD-ROM is a treasure chest of CF gold and contains an archive of Fusion Authority issues 1-30. Fusion Authority and Ektron (http://www.ektron.com/) for co-sponsoring the CD-Rom, along with other sponsors. Build your frequently accessed queries in stored procedures and create triggers to INSERT, UPDATE and ROLLBACK transactions. Check out DatabaseBlocks. You'll realize a complete return on your investment $79 in one day (you can still charge your customers the same rate). While watching the demo, one CF programmer remarked, "I just saw you do something in two minutes that took me three hours one afternoon last week. What a deal." Another commented in amazement, "Where were you three months ago? I just spent that much time doing what you just did!!" Tip: Wait for version 2.0, out in 2 weeks. What should you look for in a CF web host provider? Weigh security against features, and decide which is more important to you. Charlie is a contributor to the first book on WAP http://www.wrox.com/Consumer/Store/Details.asp?ISBN=1861004044. Download free source code and sample projects! If you are sending tiny cards because the GUI interface on a phone is tiny, get your emulator at http://www.phone.com. Peer-to-Peer networking enables everyone to communicate with everyone immediately. In the past, the cost to communicate was high so vertical hierarchies necessitated communication channels be linear, up the chain and down the chain, instead of across the chain. Networks are stronger, faster to process info and can adapt to change better. Why share our knowledge? Because we can! The value of a network increases exponentially as more people join it. http://www.cfconf.org/cfmillionaire.cfm. Written by Amy Brooks, Adam Churvis, Michael Smith and Charlie Arehart. Adam played Regis. The first of 10 people to answer the CF question correctly got to be a contender. The questions ranged from easy to difficult. 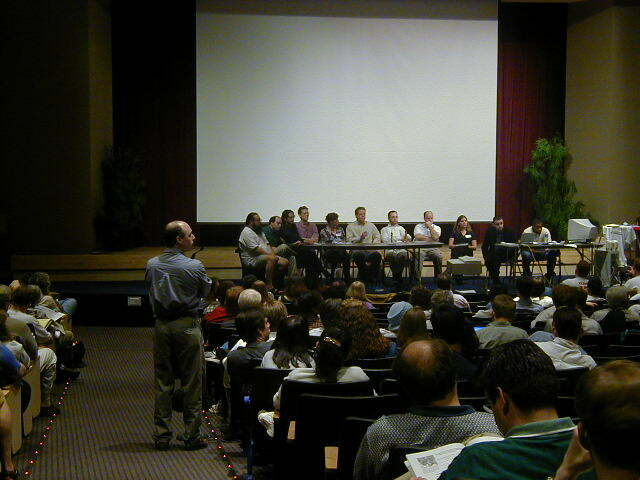 The audience participated when called upon. Who knew we knew so much? Or didn't. CFMAIL and CFPOP. Send dynamic e-mail, check out the iMS demo that retrieves a list of stock quotes and emails them back to you. Simply send email to stockquote@coolfusion.com and in the body of the email put a list of stock ticker symbols. Don't put any spaces in between the symbols. If you don't want an HTML formatted email then also put in the command mode=text in the email as well. For more information on IMS Server, check out http://www.coolfusion.com/iMSDetails.htm. FusionMail is a FREE e-mail server to add to your InFusion Mail Server bundle: http://www.coolfusion.com/FusionMail.htm. Business is booming. There has been consolidation in e-commerce world: who will be the Wal-mart of e-commerce? The next big things are 'application syndication' like CyberCash and agent-based interaction, like http://www.internetvan.net/. Steve gave both his talk and one for Hal Helms (who was home sick with a root canal). Fusebox is a FREE methodology for web application architecture available to the CF community so that you can develop efficient applications from the start. The Fusebox architecture increases teamwork efficiency, productivity, and reduces the time it takes to build a web application. 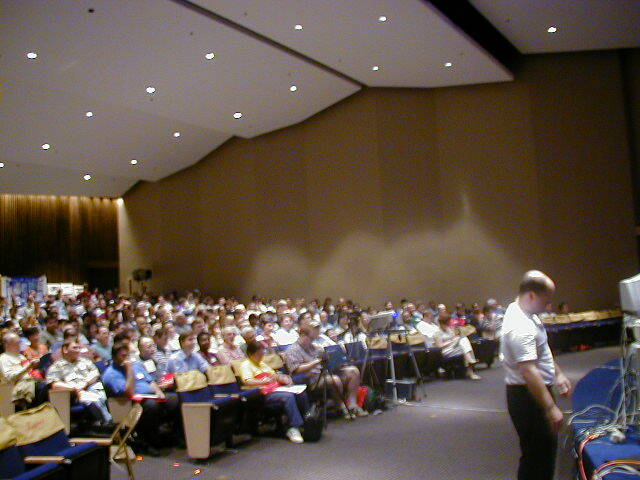 The first CF conference on Fusebox will be Saturday, September 16, in Charlottesville, VA. See http://www.fusebox.org/conference/ for details. Do you want to develop applications or manage content? Let your organization publish with less work from you. Can't afford Spectra ($16,000 to start)? Try eMPower ($2,999). eMPower enables key content providers (HR, Product Marketing, PR, etc.) to manage their own Web content while keeping complete administrative control and functionality in the hands of Webmasters and IT professionals. eMPower is a simple, affordable and scalable Web authoring and content management application to be used with a CF-based Internet or Intranet Web site. More than 100 CFers had a party at the Bethesda shark club (yes there are real sharks in a tank! 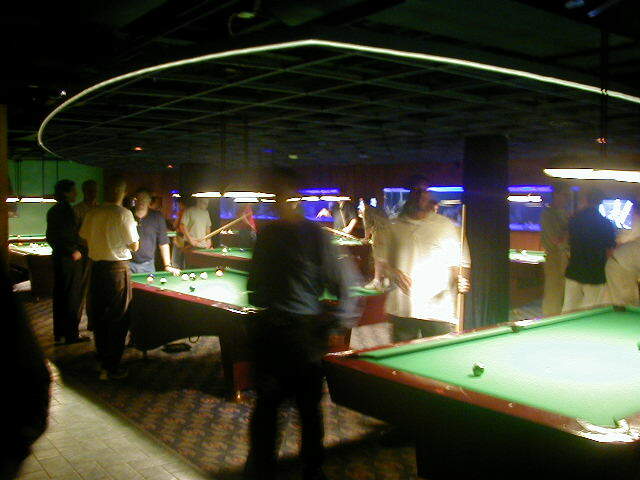 ), played pool and drank beer. Sponsored by Granularity, Coreactive and TeraTech. Playing it cool at the Shark Club. Arrays are collections of related data records. TIP: use ListtoArray and ArraytoList; they speed up your application. <CFSCRIPT> saves time with <CFSTRUCTURE>. WDDX is a programming-independent, platform-independent method to share data. It's XML. Serialize. Deserialize. Packet. Do these words intimidate you? Serialize--marking up data to WDDX format. Deserialize--extracting data into native language format. Packet--serialized data (a long ASCII text string). Get the WDDX SDK at http://www.wddx.org to develop your own WDDX apps. 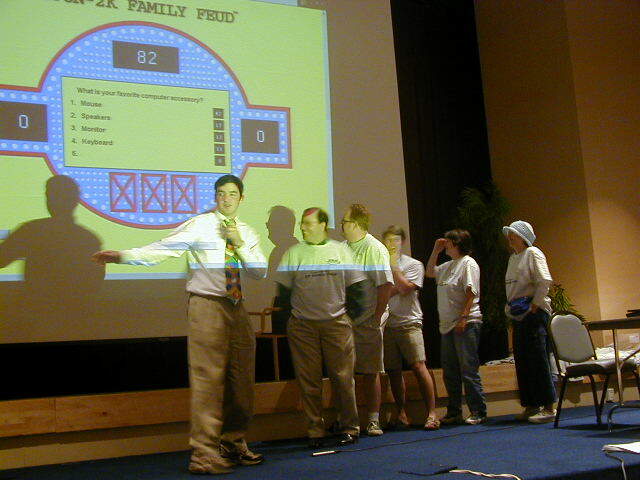 Visit the Orlando CFUG for more WDDX code at http://cfug.itcenter.org and the Ohio Area CFUG at http://www.oacfug.org. Access can and is used with ColdFusion. It is especially useful for collecting form information in a non high-concurrency environment. Be sure to use <CFLOCK>. Cut and paste the SQL code to cfquery from Access! When redeploying, compact and repair your database to shrink the size. Let the database do your work when it can, and not CF. Search the Allaire Knowledge Base on Access at http://www.allaire.com/Support/KnowledgeBase/SearchForm.cfm. Is Flash just for flash? NO! But, you can have the most optimally built CF website and if no one wants to visit, it's wasted effort. The interface does matter; flashy entertainment does engage consumers. The 'Open Tags' vs. the 'Closed Tags' tried to guess the most popular answers to the survey, "Survey says ..."
The number one answer in the Family Feud quiz to Q:"What reason do you give a client when a project is late?" 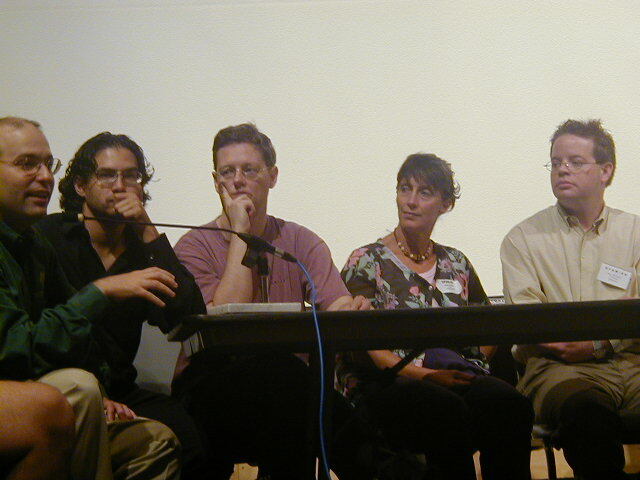 Biggest A: "Scope Creep", Smallest A: "Dog ate it"
From left to right: Chris Mosier (MC), with the 'Closed Tags' (Steve Drucker, Mike Dickinson, Steve Nelson, audience member and Judith Dinowitz) contemplating the board. Use iterative solutions, don't check 'the whole enchilada' at once. Tools make it easier for you to debug your CF applications. CF Studio lets you 'Validate Document', but what if your issue is more than that? 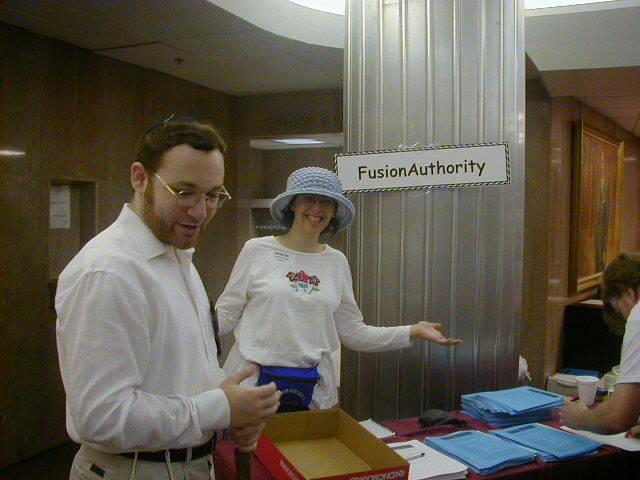 Michael and Judith Dinowitz at the Fusion Authority table with the first ever print issue of Fusion Authority! There are 450,000 CF developers, but only 1,800 people on CF-Talk http://www.houseoffusion.com/hof/lists/CF_Talk.cfm sharing information and 30,000 more are subscribers to CFDJ (http://www.sys-con.com/coldfusion/). There are incredible resources available to the CF community. Are you contributing your knowledge by writing? Are you reaching out to the people you know to include them and increasing the pool of CF developers? CF is programming. Program CE (continuing education) into your CF day. FusionAuthority is a free weekly news on just ColdFusion--subscribe today! Spec the problem. Uncover the business processes BEFORE you build your software model. Maybe, just maybe, the PROCESS needs a changin'. Simplify, simplify, simplify. Use a 'single template wizard' constructor. Get more code at http://www.figleaf.com/figleafhome/cfug/cfugnews.cfm. Charlie generously spoke in Leon Chalnick's absence (Caught in bad weather on plane from LA) on this topic. Tip: Highly relational data should not be moved into Spectra. Spectra is a content OBJECT database. What should you know before you even begin with Spectra? The example is http://www.hr.com, where the pages are stored in a relational database and the content is stored in Spectra. Once you pass the steep learning curve, Spectra is RAD (Rapid Application Development). Talk with your Spectra peers at http://www.houseoffusion.com/hof/lists/Spectra_Talk.cfm and David will help you, too, by phone and in your office. 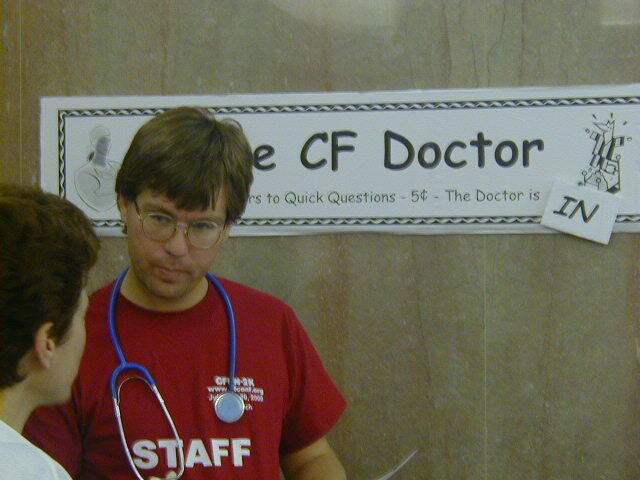 "CF Doctor" Douglas Smith practices CF medicine.